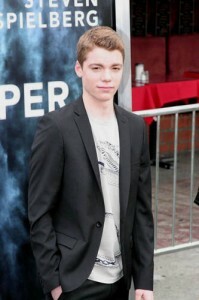 Gabriel Basso can currently be seen on the big screen in SUPER 8. Mr. Basso plays Martin, the lead detective in his friend Charles’s super 8 film project. Gabriel has also been seen in the film MEET BILL. He currently co-stars in THE BIG C which sees its second season premeire June 27, 2011. Gabriel recently took the time to speak with us about SUPER 8. Hey Gabe. How’s it going? Good, good. Congratulations on the movie. It was one of the most anticipated films of the summer and it is definitely getting a lot of praise. So congrats are being a part of that. Well, being from St. Louis, the first question I have to ask is what part of St. Louis are you from? And when did you move to LA? About two, two and half years ago. Was acting something that you were always interested in? Not really. It was sort of something that I fell into. My two sisters were into acting and modeling, and I just sort of followed suit. Tell me about auditioning, getting the part, and meeting with JJ Abrams. Well I was at my grandma’s funeral in Detroit when I got the script. So I had to read some lines and send in a video. My mom and I go into the bathroom and pull out a flip camera. I read the lines and send in the tape. I head back to LA, and as soon as I land I get a phone call saying that I had to head over to Bad Robot right away. This was on Wednesday. So I go in and audition and then they call me on Friday saying that I got the part. I flew out to West Virginia the next day. I was cast right at the last second. One of my favorite things about the film is the chemistry between your character and all of his friends. Just watching you guys interact with each other was awesome. Was that just a natural thing, and what did Abrams tell you guys? The guys were great. We got along really well. They actually all knew each other before I was even cast. My audition was a cold table reading with everyone. I was kind of thinking they were screwing up my chances because they would laugh between lines or at things I would say so I was kind of thinking “shut up guys” (laughs). I wasn’t sure if I should just laugh with them or not. But they were awesome. Most people who are familiar with JJ Abrams would probably freak out if they got a chance to meet him. This is the guy who created LOST and rebooted STAR TREK among other things. What was it like working with him? It was amazing. He is so interesting to work with because his mind is always working. If he wasn’t doing a movie he would probably be creating music or working on an art piece. He is just always thinking. So it is amazing to see him work. Abrams has said how much of an influence Spielberg was on the film, and how he wanted to make an Amblin picture. How often was Spielberg on the set? Did you get to meet him? Yeah, he came to the set as much as he could. He is working on his next film, WARHORSE, so he was busy with that. And then, you know, whatever Steven Spielberg does with his time. Hunting aliens or something like that. But yeah, he was there a decent amount, but every time he came I was in school so I never got to meet him on set. The other guys I talked to said he was cool. I finally got to meet him at the premiere. I read that you guys got to write all of the scenes you were in for the super 8 film you made in the movie. Did you all work together or did one guy kind of take the reins? JJ let us write all of our own dialogue. So any scene I was in I got to write. That was pretty cool just to get to do our own thing. Is that something you are interested in for your future, writing? Or would you rather just be in front of the camera acting? I could see myself writing or directing. Definitely not right now. I mean I can write for that kind of film, but nothing actually substantial right now. What did you think of the final creature? Was it what you had pictured? The first time we all saw it was at the premiere watching the film. The script was pretty vague with the description, and obviously, we were working against a green screen the whole time while filming. None of us saw concept art or knew what to expect. But it was cool. I liked it. SUPER 8 was one of my most anticipated films of the summer. What are some of the upcoming films that you are looking forward to? Whenever THE HOBBIT comes out. I’m really excited about that. The new TRANSFORMERS film is something that I want to see. Are you able to see a lot of films or are you kind of too busy? Well right now I have been working so not really. But today is actually my last day of filming. THE BIG C. It’s on Showtime. For people who are not familiar with that, tell us about the show. Yeah. It’s about this woman who just discovered that she has cancer. Before she learned she has melanoma, she kind of just went through life. So everything changes for her. Laura Linney is the main character. And you play her son? Yeah. It’s a great cast. Oliver Platt plays my father. And Gabourey Sidibe from PRECIOUS plays my friend from school. So what have you got planned for the rest of your summer? I am going to Michigan with my family to go camping and fishing. We are leaving today when I finish filming. Then maybe come back to California or Missouri. I have a couple of projects that I am looking at. What types of things do you enjoy doing when you come back to St. Louis? Just seeing my family. Being with my friends. Coming home. It’s a good time. Thank you so much for taking the time to talk with us this morning, Gabe. And again congratulations with the film. We look forward to seeing more of you in coming years.